Check my previous post for a discussion of this project — this post provides the instructions. Briefly: 1. Place a square of paper (this one is 6″ on each side) with the wrong side up, positioned so that it looks like a diamond. 1a. Using a glue stick (available at any drug store, craft store, school supply store) put a bit of glue in the center of the paper, and then center a slightly smaller (about 1/2″, so in this case 5.5″ on a side)piece of parchment paper over the initial square and press to make it stick. I have found, at least with the silicone parchment paper I was using (purchased on Amazon from Golda’s Kitchen) that glue dots (available at craft stores like Michael’s) do not work — double sided tape probably would. Regular kitchen parchment paper that comes in rolls is fine to use, I just go a little crazy trying to cut it to size when it wants to curl up! 2. Fold the bottom point of the papers up to meet the top and crease the resulting bottom edge; the result should look like the photo in 3. 4. Now bring the bottom left corner up to meet the right edge and crease; the top edge of this folded section should be parallel to the bottom edge. 5. Do the same with the bottom right corner and crease. 6. & 7. 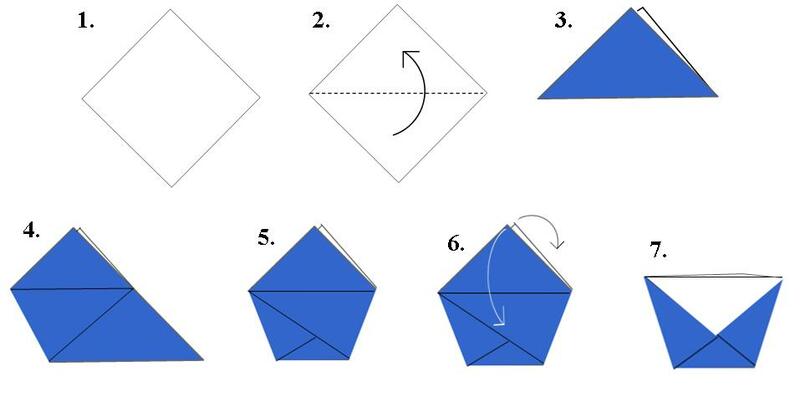 Finally, fold the top triangles down on the front and back of the cup, and crease. My art teacher said that is how to make a cup!! !